One of my favourite things to order at a Taiwanese restaurant is their Green Onion Beef Rolls 牛肉捲餅. A lot of times you will find this at BBT shops. 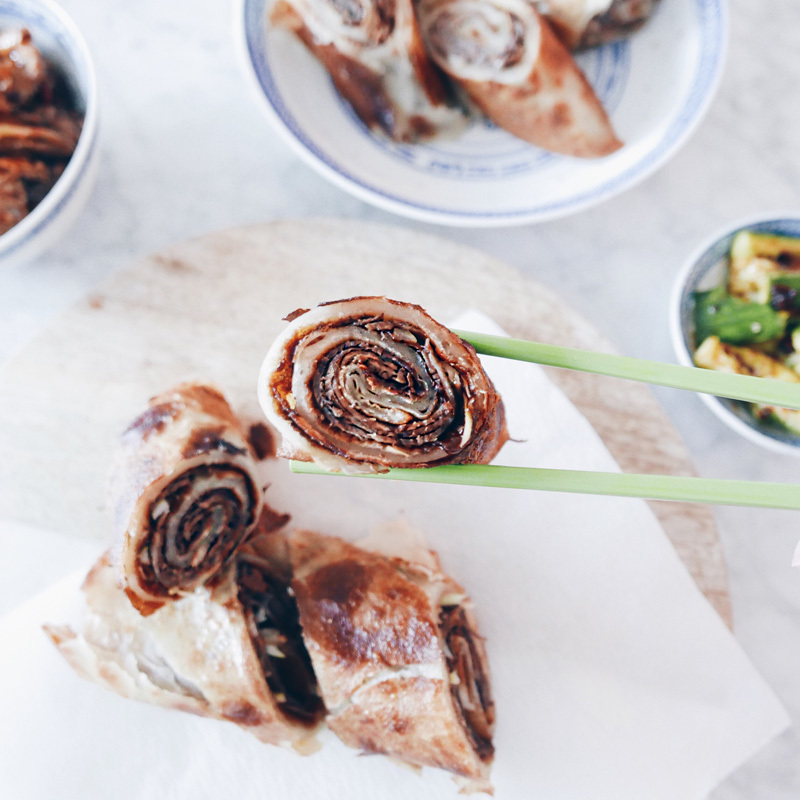 This Taiwanese burrito makes a great snack! I love the pan fried scallion pancake on the outside, wrapped around tender beef shanks, cucumbers and lots of scallions. I love the sweet hoisin sauce that binds everything together. Of course, this dish has a varying degree of success restaurant to restaurant. Some are too oily, while others are too salty or saucy. So, I decided to make my own version of this infamous beef roll. And honestly, it is so damn easy to make (especially with an InstantPot). I love a crispy, flaky, green onion pancake with a little chew. It shouldn’t been overly greasy or heavy with shortening. This classic snack can be enjoyed on it’s own or paired with some delicious tender beef shanks. Often I would make beef shanks in my Instantpot ahead of time like I do with braised beef brisket and tendons. It goes perfectly with a bowl of noodles or as a side dish. Making scallion pancakes 蔥油餅 at home is fairly easy and it takes only 5 ingredients: All purpose flour, hot water, salt, sesame oil and green onions. Sometimes I also add in some cilantro just because I LOVE cilantro. I can never get enough! In a large bowl, mix AP flour with hot water. Whisk together while alternating between flour and water until water is absorbed and dough pulls away from the side and dough is formed. Knead for 8 mins. Lightly flour surface for easier handling. Cover dough in plastic saran wrap and let rest for 20-30 minutes. Divide dough into 8 balls. First Roll: Roll out each ball into a circle with a rolling pin. Sprinkle salt and top with FCGO (finely chopped green onions). Brush surface with sesame oil. Coil the dough and green onions into a bundle. Tuck in the ends and press dough to flatten. Second Roll: Divide dough into 8 balls. Roll out each ball into a circle with a rolling pin until it becomes 1/8″ thick. Heat a non-stick fry pan over medium heat. (You can set your InstantPot to sauté mode). Once the pan is ripping hot, gently place your scallion pancakes in the fry pan. 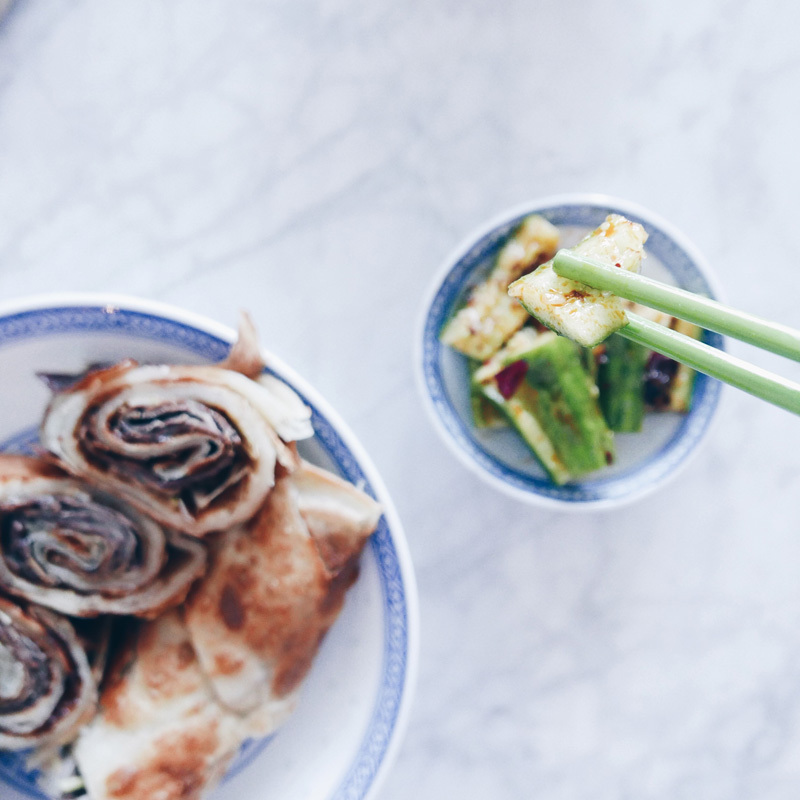 Fry the green onion pancakes until golden. Approximately 1-2 minutes depending on your stove. Keep a watchful eye! Set aside on wire rack to cool or place them in the oven at 200F to keep warm while you fry the rest. 滷牛腱 Braised beef shank is an easy dish to eat as a snack or paired with noodles or green onion pancakes 蔥油餅! Blanch beef shank in boiling hot water for approximately 5 minutes to remove impurities. Cut the shank in half (depending how long it is to fit into InstantPot). Add cooking oil in Instant Pot and press Saute Mode. Add shank and brown the meat. Cook in Pressure Cooking Mode for 30 minutes. Place in freezer for 20 minutes or fridge for 1 hour so the meat tightens. This will help to give you nice looking slices later. Set aside; Served alone as snack or with rice or soup noodles. 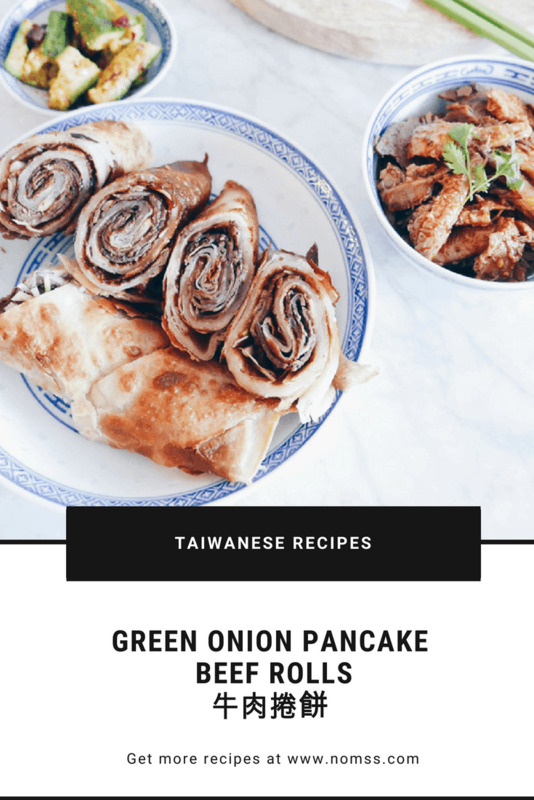 The spirit of Taiwanese Green Onion Beef Rolls comes from the sauce as much as the crispy pancakes or tender beef shanks. This sweet savory sauce can be used as a dip with other savoury snacks. 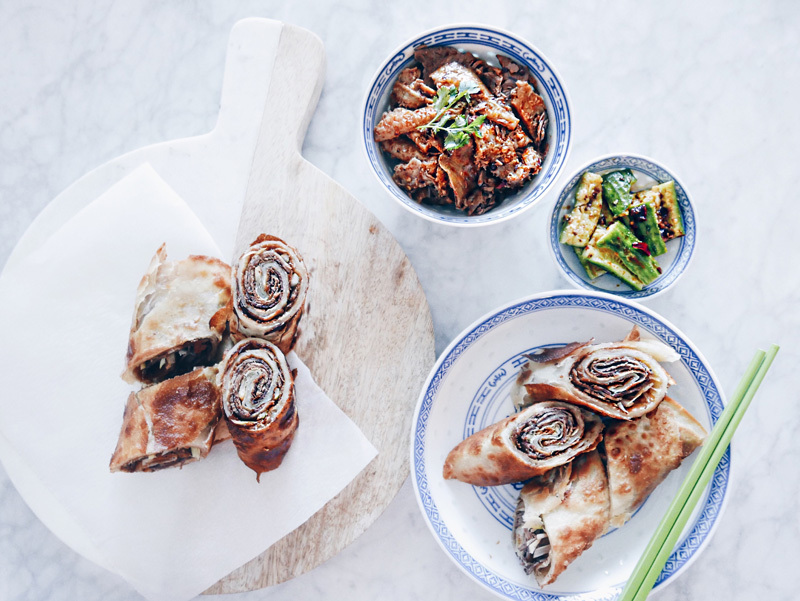 Easy to make scallion pancakes 蔥油餅, Beef Shanks and Taiwanese Beef Rolls at home is fairly easy and it takes only 5 ingredients: All purpose flour, hot water, salt, sesame oil and green onions. Warm up your Taiwanese Green Onion Scallion Pancakes 蔥油餅 at 200F for 10 mins (if you’ve previously let cooled). Roll up and cut your pancakes at desired width. Served with XO sauce and extra Hoisin sauce. Pro Tip: Make extra beef shank. Save the broth from the InstantPot and make noodle soup with later. Can be frozen up to a week.